For today, I'm going back to the beginning of my mamahood. I found this picture recently, and it brought back a flood of memories and emotions. It's Calvin and I four years ago, in our old apartment...before Steve "found" his career, before Ezra and Adelaide, before our house--it all seems like a million years ago. I was (and still am, I think) a young, young mother. 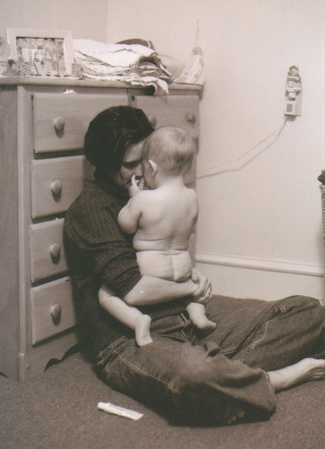 I was 23 when I met Steve, instantly fell in love and married, and decided right away to have a child. Just out of college, really...I spent only two years working. None of my friends had children--or were even close, and I suddenly found myself completely alone and isolated in so many ways. I was full of such a powerful love for this little boy of mine, and yet I was completely overwhelmed... by parenting him, figuring out my new role as someone's wife, and making meaningful connections with other parents. I had all these strong convictions and ideas about how I wanted to parent in a gentle, respectful way--yet it was so unlike any kind of parenting I had experienced or even witnessed much of at that point. This photo is a reflection for me of the complexity of all those feelings together--of my deep love for my child, a strong passion to be the parent I wanted to be, and the immense struggle to make that happen. Lots of things have changed since that moment....I have so many more resources to parent with; have found myself in a supportive community; and I have lots more confidence in myself, and even a little experience now, as a mama. But the struggle--sometimes ugly, sometimes beautiful-- remains each and every day to really *listen* to my children and myself, and to be the parent they deserve to have. Self Portrait Tuesday bloggers here, with a great November theme of "Exploration of Identity." Kath, you rock...thanks for making me really think about this each week.